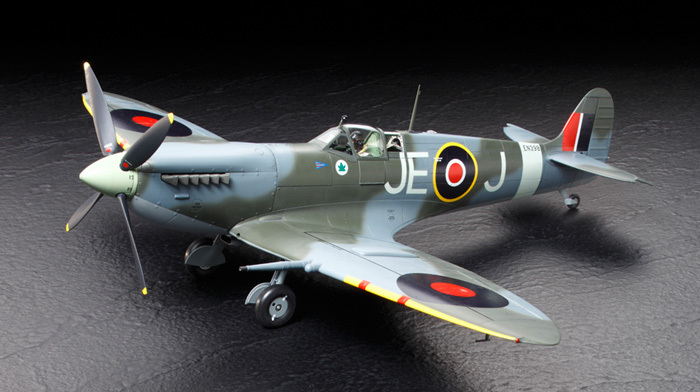 TAMIYA 60319 SPITFIRE MK.IXC (1/32) scale model kit! 1/32 scale plastic assembly kit of the Spitfire Mk.IXc. Overall Length: 302mm, Overall Width: 352mm. 2 kinds of parts for top and bottom engine cowlings, wingtips, rudder, and elevators included. Features moveable ailerons. Flaps can be depicted in either up or down position. Comes with 3 kinds of markings including one to depict the aircraft piloted by RAF ace Johnnie Johnson.